For something that every single person that stumbles across this blog uses many times a day, remarkably small numbers of people actually know very little about the history of the internet. Or even how it works today. The younger you are, there’s less of a reason to question why something’s there and how it started working – and whether that infrastructure and those reasons have changed over the years. Of course, there’s little need to sit and think about such weighty issues as what the difference is between the Internet and the World Wide Web when most of your day is spent together alone within the walled gardens of Facebook…. But for anyone who wants to find out a bit more however, I’d recommend reading ‘Tubes’ by Andrew Blum, a travel book with a difference – as the author travels to visit the physical manifestations of the internet today around the world and explores some of the history. Another useful source to check out is the Internet Society’s history which you can download here as a PDF. 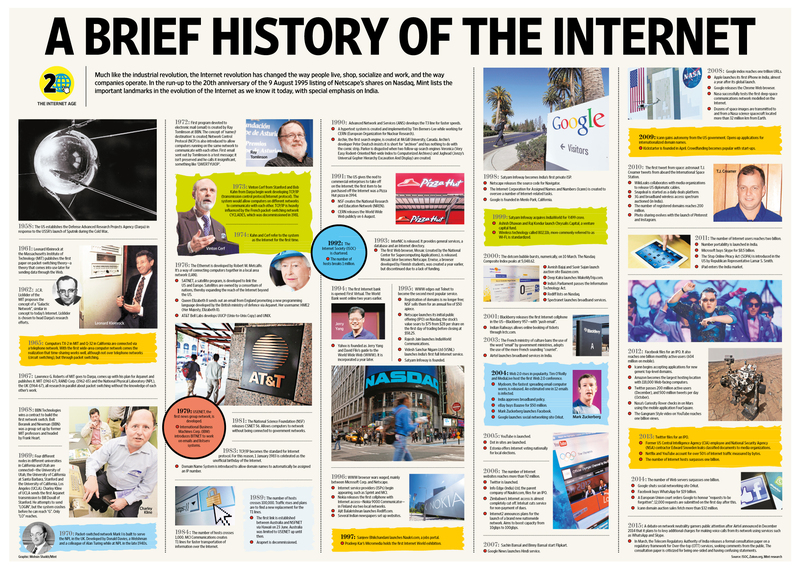 And finally if you’re more visual, check out the quick summary here: ‘A Brief History of the Internet‘. It’s all just a starter but it feels like the sort of modern history that’s somewhat under-appreciated in the wider scheme of things.